Please click on "Add to basket" and then click "View basket". On completing the checkout information you will receive an email with a link to the instructions. Please click on the link and it will open for you. You can now print them. All files are in PDF format. Pen bushings for Mini Rifle Bolt Action Pen Kits / Rifle Bolt Action Pen Kits / Lock 'n' Load Bullet Pen Kits. The ergonomic knob and smooth spring slide action combine to make thumb operation fast, easy and fun. Its tube and bushings are same as our bolt action pen kits. 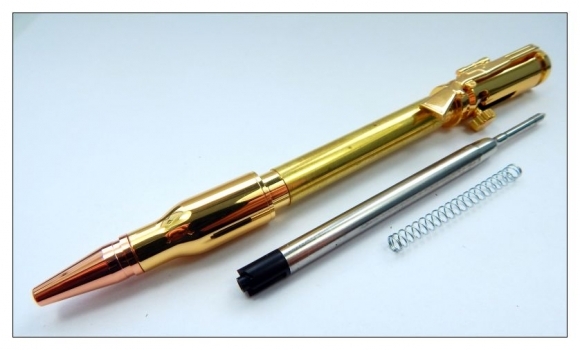 Drill size 3/8"
3/8" Bradpoint used for Mini rifle bolt pen kits, rifle bolt pen kits and Polaris twist pen kits. ©2016 penkitzandbitz.co.uk - All rights reserved.